Free Download Brit Awards 2019 Full Show Video, Winners & Nominees Songs etc. Brit Awards, this prestigious annual pop music awards, celebrated its 39th ceremony which was held on 20 February 2019 at The O2 Arena in London. Jack Whitehall was announced as host in December 2018. Hugh Jackman opened the ceremony on 13 February 2019 and Pink would close the ceremony. Regretful for missing Brit Awards live? Don't worry! We can also watch full show consisting of amazing live performances, best moments and highlights online or download for a better playback. Now, this article will tell you how to free download Brit Awards 2019 full show video, winner/nominees' songs and more in (1080P) HD MP4 for playback offline whenever whereever. WinX YouTube Downloader is the right choice to free download Brit Awards full show video, songs/albums/playlists of winners and nominated artists and other Brit Awards videos, like performances, highlights in HD (1080P) MP4. This all-in-one music/video downloader is a 100% clean and safe program helping you free download any SD/HD/4K/3D/VR videos from 600+ sites, including YouTube, Instagram, Twitter, Facebook, Vevo, SoundCloud and more with ease. DOWNLOAD and install WinX YouTube Downloader on your computer. Follow the tutorial to free download Brit Awards full show video. Step 1. Luanch WinX YouTube Downloader and clik Add Url. Step 2. Search Brit Awards full show or other videos on any supported sites. Copy the link and click Paste & Analyze URL. Step 3. Soon, the list of results varying from quality (resolution), extension (format), frame rate and size will be shown. Select one result and click Download Selected Videos. Step 4. Click Browse button to set an output folder if necessary. Next, click Download now to start downloading Brit Awards full show video. After the download process is finished, you can get Brit Awards full show or other related videos in the target folder and play it immediately or transfer to iPhone, iPad, Android for a movable watching. 1. If you want to batch download videos/songs of Brits , please repeat step 1, 2, 3 to add multiple videos into download list and perform step 4 at last. 2. The software developer does not advocate downloading copy-protected videos from YouTube for any commercial purpose and suggests referring to "Is it legal to download YouTube videos" before doing so. 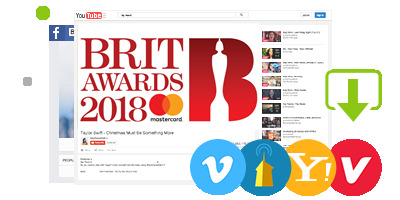 • Free download videos of Brits and other music awards/festivals, songs, movies, TV shows and more from YouTube, Vimeo, Dailymotion etc. • Extract audio from videos as MP3, AAC, AC3, FLAC, M4R and other popular audio formats for later playback or further editing. • Convert online/local videos to HEVC, H.264, MP4, AVI, WMV, MOV, FLV, 3GP, iPhone, iPad, Android, Xbox, PS3/4 etc, with super quality.